For two weeks in November of 2013, I had the privilege of participating in a uniquely American experience. I participated in a civil jury trial in Orlando, Florida (in the Orange County Courthouse, the same courthouse in which Casey Anthony was on trial for first degree murder in the death of her daughter). I was joined in this priceless experience by my brother-in-law, Sean Domnick, the managing partner of Domnick & Shevin, PL, and Jennifer Lipinski, one of his law partners. On March 23, 2013, a Mears Transportation Services driver stopped her motor coach in the right lane of Epcot Center Drive, approximately 1000 feet from the Epcot Theme Park vehicle entrance, to inspect the outside of the coach for the source of a “new” noise she claimed to be hearing. After activating the coach’s four-way flashers, the driver, who had no mechanical training, exited the vehicle to perform the inspection. While her testimony was that the noise might mean a wheel base fire, she did not take the vehicle’s fire extinguisher with her on the inspection. After slowly circling the motor coach, the driver then walked down to the tree line alongside the roadway to make a personal phone call. (An independent eyewitness saw her on the telephone down by the tree line.) Ten seconds into this personal call — confirmed by cell phone records — our client, a Walt Disney World bus driver, crashed his Disney bus into the back of the Mears motor coach at approximately 30 mph. The accident happened at 2:00 pm on a clear and sunny day. Our client testified that he first observed the Mears motor coach from about 1000 feet off, when approaching from behind on Epcot Center Drive, but did not perceive that it was stopped. When he finally perceived that the coach was stopped, it was too late for him to avoid the crash. 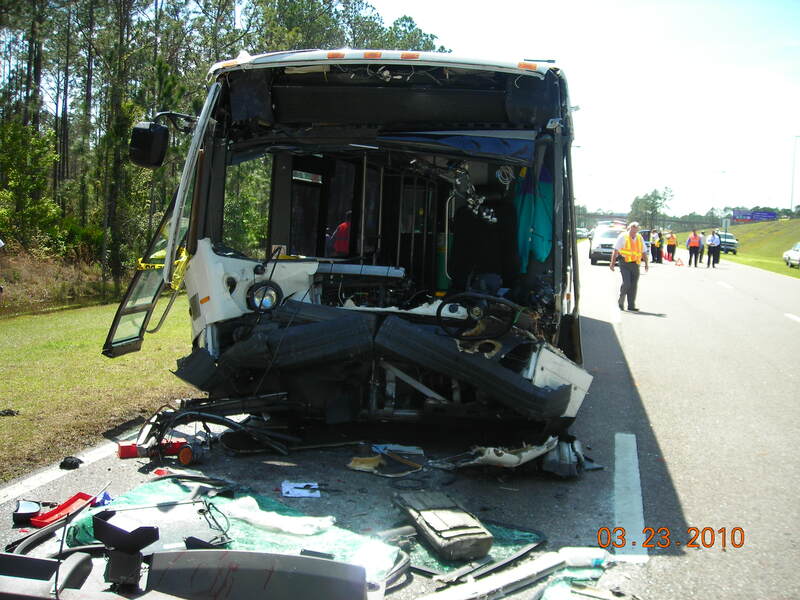 We sued on behalf of the Disney bus driver, who was severely injured (e.g., he had to be airlifted by helicopter to Orlando Regional Medical Center), and his wife (also employed by Walt Disney World, as a housekeeper), alleging that the driver created a dangerous condition by stopping the motor coach in the roadway. 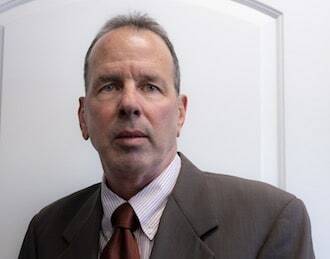 We established through “human factors” expert testimony — our expert was Dr. Mike Maddox — that it can be difficult for the human brain to calibrate the rate of approach from behind. It is a recognized and studied scientific concept. Encompassed within the concept is a phenomenon known as “looming threshold.” LT is the point at which the human mind finally comprehends the rate of approach. The parties fought over the LT point. Defendants’ expert testified that, at 30 mph, the LT is roughly 345 feet, enough distance for the accident to have been avoided; Plaintiffs’ expert said 189 feet, too short a distance, in the opinion of both experts, to avoid the crash. From jury selection to verdict, the trial lasted 8-1/2 days. The jury deliberated for 18 hours over the course of three days, eventually returning with a verdict totaling nearly $2.7 million. It decided that our client was 65% at fault, which will reduce the verdict by the same percentage. Defendants have filed post-trial motions to nullify the jury verdict both as to fault findings and damages. Defendants are likely to appeal. The trial confirmed my respect for the civil trial jury system. When the proceedings are presided over by an outstanding judge, no other system devised by humankind is better. Our judge, Donald A. Myers, Jr., was beyond outstanding. He is wise, intelligent, and fair; he was even-mannered and respectful of the lawyers and their respective clients. Judge Myers allowed the parties to engage in full and complete voir dire — nearly one full day. Not every judge allows the time and openness required to do it right. The purpose of voir dire is to seat fair and impartial jurors. Seating jurors of this ilk is the key to maintaining the integrity of the jury system. Bad apples, even one, can taint the process. Our jury, consisting of six men, worked exceedingly hard. Each man put aside work and personal matters to perform this important civic duty. They sat patiently and attentively through hours of testimony, taking notes and sometimes asking questions. Their commitment to the cause is best demonstrated by their eighteen hours of deliberation. No rule or law requires a certain minimum amount of deliberation time. How long a jury deliberates is strictly up to each individual jury. This jury deliberated for 18 hours because it was determined to get it right. My hat is off to them. Post-trial I told them that I have six new heroes. They took to heart Thomas Jefferson’s commitment to the jury system. Every U.S. citizen should be required to attend a jury trial, civil or criminal. Doing so would disabuse them of the false notion, created by right-wing propaganda, that the jury system is a bad thing; the experience would help them discover the importance of the jury system to the American ideal. What the right-wing disdains about the jury system is that it gives the weak a fighting chance against the strong. Take our case, for example. Our clients, both Haitian immigrants (both, now, U.S. citizens), were able to marshal the might of the American court system to obtain justice against one of the most powerful companies in the Orlando area. It’s a beautiful thing.